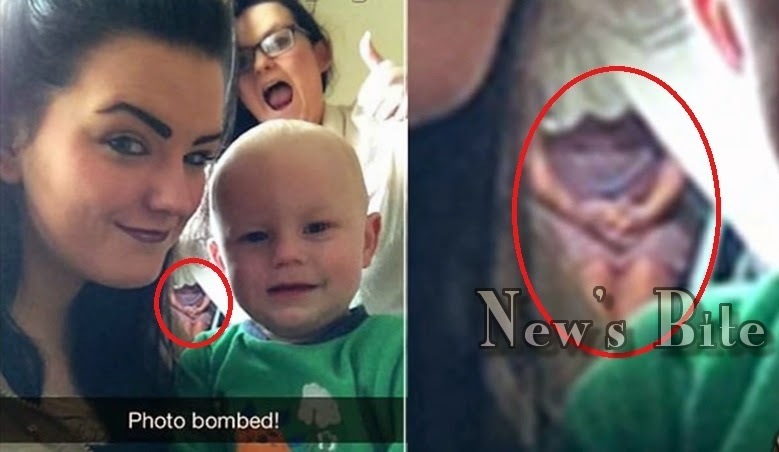 A Snapchat selfie that turns to be a spooky scene after teenage Bethany Harvey took an image of herself, her baby nephew and her sister without noticing that a simple selfie photo will become viral in the social media network. Bethany, captured a photo of a ghost that Shows what seems to be girl in purple dress with hands folded in her lap, at the background of their picture in the living room. she did not noticed the ghost girl in the picture till her friend come by and told her that ghostly body in the background of their picture. Bethany Harvey of Northern Ireland, said that she never expected a creepy precence to pop up on their snap chat picture. She explain that she was taking a picture of herself and her baby nephew, when her younger sister jump over the back ground so that she caption the picture as “Photo bomb”. Bethany, also said that she was sure that no one is around that day in the living room during day time except her, her baby nephew and sister. A lot of things has been spooky in the living room, I never go to the living room during night time anymore Its feels weird and spooky that I might seen something? Similar incident of this ghost appearing in photo that has been captured has became accustomed to. As it many of this ghost picture are always captured accidentally. No Comment to " Viral Picture Of Purple Ghost Girl Captured By Teenage Girl During Snapchat "